Buffalo/Mna rats spontaneously develop FSGS and nephrotic syndrome as a result of an immune disorder. Similar to some humans with FSGS, the disease recurs after renal transplantation, suggesting the involvement of a circulating factor. Here, we tested the effect of several immunosuppressive treatments on these rats. Although corticosteroids, cyclosporin A, and anti–T cell receptor treatment reduced proteinuria, only the deoxyspergualin derivative LF15-0195 led to a rapid and complete normalization of proteinuria. Furthermore, this compound led to the regression of renal lesions during both the initial disease and posttransplantation recurrence. The frequency of splenic and peripheral CD4+CD25+FoxP3+ T lymphocytes significantly increased with remission. Moreover, the transfer of purified LF15-0195–induced CD4+CD25+ T cells to irradiated Buff/Mna rats significantly reduced their proteinuria compared with the transfer of untreated control cells, suggesting that LF15-0195 induces regulatory T cells that are able to induce regression of rat nephropathy. These data suggest that idiopathic nephrotic syndrome/FSGS disease can be regulated by cellular transfer, but how this regulation leads to the reorganization of the podocyte cytoskeleton remains to be determined. Idiopathic nephrotic syndrome (INS) with primary FSGS lesions is a disease of unknown cause that is defined by selective proteinuria, hypoalbuminemia, and nonspecific lesions with a glomerular sclerosis. Although treatments such as corticosteroids, cyclosporin A (CsA), and cyclophosphamide remain useful, at least 20% of affected patients ultimately require hemodialysis and/or kidney transplantation for end-stage renal failure. Moreover, despite treatment, the initial disease immediately relapses in 30 to 50% of transplant patients1 and leads to the loss of the graft. This immediate (and iterative) recurrence, together with the beneficial effect of plasmatic exchanges2 or immunoadsorptions,3,4 strongly supports the presence of a circulating factor. The majority of animal models of FSGS present secondary forms5–7 and do not supply a causal model with a permeability factor.8 The Buffalo/Mna rat strain develops a spontaneous glomerulonephritis (with albuminuria, edema, and lipidic disorders) at 3 mo of age, and FSGS lesions appear at 4 to 6 mo of age.9,10 In addition to a genetic background predisposing to proteinuria11 (a growing concept also noted in humans), we recently highlighted the involvement of an extrarenal circulating factor. We demonstrated both the recurrence of the initial disease after transplantation of normal rat kidneys into Buff/Mna recipients and remission when nephrotic Buff/Mna kidneys were transplanted into normal rats.12 We also highlighted the involvement of activated macrophages and Th2 lymphocytes in this disease,13 as reported in the human disease. All of these findings suggest that this rat model may be relevant for studying the challenge of INS recurrence after transplantation in the clinic. In this study, we used the Buff/Mna strain to test the antiproteinuric effect of various immunoregulatory compounds. Only a deoxyspergualin (DSG) derivative, LF15-0195,14 specifically induced a rapid and complete remission of the initial kidney disease as well as its posttransplantation recurrence. This effect was manifested as a resolution of both proteinuria and histologic lesions. These findings may provide novel insights into the development of innovative, clinically applicable therapeutics for the treatment of INS. Corticosteroid treatment significantly reduced urinary protein excretion (lowest proteinuria at day 10 51% reduction), but treatment did not lower levels to those within the normal range of proteinuria for healthy rats (<0.2 g/mmol). In the same way, CsA treatment and the combination of corticosteroids and CsA resulted in a significant decrease in proteinuria (lowest at day 30 64% reduction; lowest at day 63 68% reduction, respectively) but again did not normalize it (see Supplemental Figures a through c). The administration of R7.3 antibodies for 9 d rapidly decreased proteinuria (50% reduction), but this decrease was transient and did not reach normalization. The combination of R7.3 and CsA significantly decreased proteinuria (65%) but did not normalize levels (Supplemental Figure d). Effect of LF15-0195 on the Initial Nephrotic Syndrome. First, we showed that LF15-0195 treatment prevented the development of nephrotic-range proteinuria in 2-mo-old Buff/Mna rats when administered at the onset of proteinuria (0.2 g/mmol; Figure 1A). The prevention of proteinuria occurrence in these animals was still efficient 1 mo after treatment withdrawal, at which point proteinuria reverted progressively to reach the values observed in vehicle-treated, aged-matched Buff/Mna rats. At a later stage of the disease in which the animals had developed a persistent proteinuria (mean 0.5 g/mmol; day 100), the re-introduction of LF15-0195 promptly reduced proteinuria to the normal range (<0.1 g/mmol at day 120; Figure 1A). Normalization of proteinuria was also achieved 20 to 30 d after LF15-0195 treatment of proteinuric Buff/Mna rats (P < 0.05; Figure 1B) and was efficient 1 mo after treatment withdrawal. In addition, LF15-0195 administration had no effect on serum creatinine levels (28 ± 5.2 μmol at day 0 versus 21 ± 1.6 μmol at day 30 and day 130 [remission phase]; NS). (A) Beneficial effect of a derivative of DSG, LF15-0195, on both the onset of proteinuria and established proteinuria in young Buff/Mna rats. Each treatment was administered for 30 d at a dosage of 1 mg/kg per d (n = 5). The control group consisted of vehicle-treated Buff/Mna rats. (B) Effect of LF15-0195 compared with LF15-0296, an isomer without any immunosuppressive effect, on the proteinuria of 6-mo-old Buff/Mna rats. The two treatments were administered for 30 d (n = 5). (C) LF15-0195 reduced the proteinuria of Buff/Mna rats experiencing recurrence of their initial disease after kidney transplantation. The treatment was administered for 30 d (n = 5). The control group consisted of untreated Buff/Mna rats experiencing recurrence of proteinuria after kidney transplantation (n = 5). Proteinuria is expressed as the ratio of the urinary proteins (g/L) to urinary creatinine concentration (mmol/L). Data are means ± SEM (scale bar). *Significant decrease in proteinuria (versus day 0), P < 0.05; **P < 0.01. Regardless of the initial levels of proteinuria (ranging from 0.35 to 5.10 g/mmol; 59 supplementary rats; Supplemental Figure e), the normalization of proteinuria was observed in every Buff/Mna rat treated with LF15-0195. Effect of LF15-0195 on Renal Lesions. Light microscopy examination of LF15-0195-treated rat kidneys obtained during proteinuria remission showed a subnormal renal histology (n = 6; Figure 2, B through D). In comparison with lesions usually seen in age-matched Buff/Mna animals (n = 4; Figure 2, A through C), treated rats had no tubular dilation (0.83 ± 1.1 versus 19.5 ± 13.1%; P < 0.01) and only a few glomerular FSGS lesions (defined by segmental lesions of flocculus, sclerotic area, flocculocapsular synechia, or atrophic glomeruli; 3.3 ± 1.8 versus 10.9 ± 1.5%; P < 0.001). 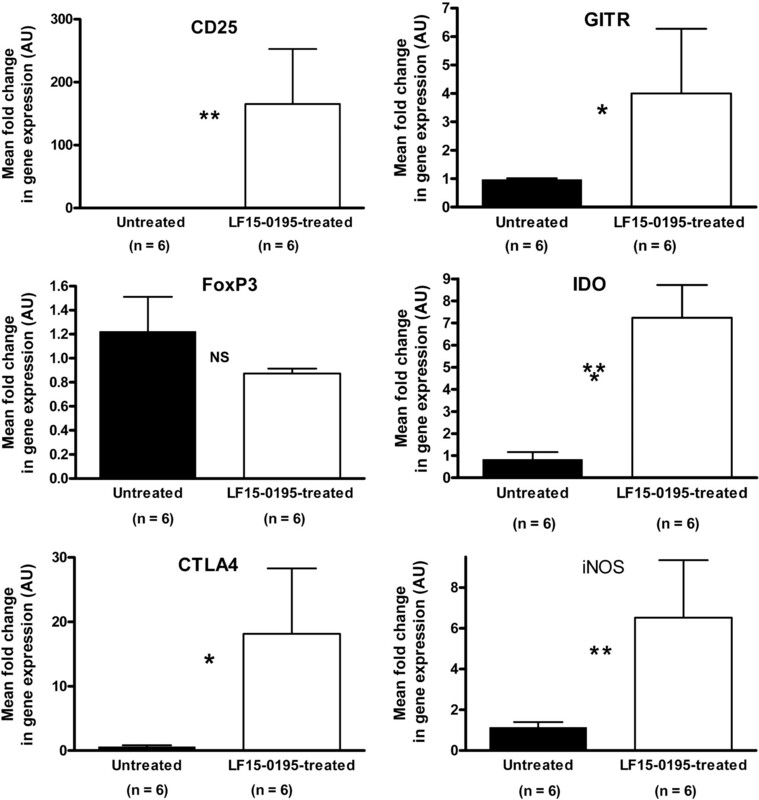 These findings demonstrate the effect of LF15-0195 at the histologic level. We detected no renal fibrosis in either group and only a minor and diffuse interstitial infiltrate in the untreated group, but we sometimes noted a trend toward a periglomerular reinforcement (see also13). 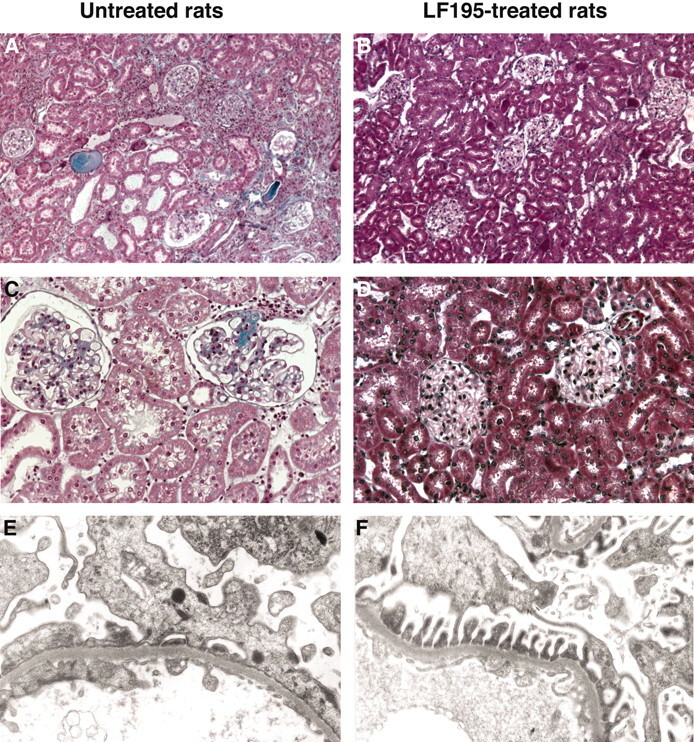 (A through D) Light microscopic examination of native kidneys from untreated age-matched Buff/Mna rats showing major tubular alterations (A) and FSGS lesions (C; n = 4) and LF15-0195-treated Buff/Mna kidneys showing a subnormal renal interstitium (B) without glomerulosclerosis (D; n = 6; periodic acid-Schiff staining). (E and F) Electron microscopic examination of age-matched kidneys of native Buff/Mna rats showing some flattening and foot process fusion (E), compared with LF15-0195–treated Buff/Mna kidneys showing a normal ultrastructure with well differentiated and organized foot processes (F). Magnifications: ×100 in A and B; ×200 in C and D; ×15,000 in F.
Electron microscopic examination of treated Buff/Mna rat kidneys revealed an absence of foot process fusion and cytoplasmic vacuolization (Figure 2F). In contrast, the untreated age-matched Buff/Mna kidneys showed focal and moderate podocyte lesions with foot process flattening and fusion (Figure 2E). Effect of LF15-0195 on the Recurrence of the Nephrotic Syndrome after Renal Transplantation. LF15-0195 was then administered as a treatment for Buff/Mna disease recurrence. Normal histocompatible kidneys (from healthy Lew.1W) were grafted into proteinuric Buff/Mna recipients. When the Buff/Mna rats that underwent transplantation became again proteinuric (>0.4 g/mmol), the administration of LF15-0195 reduced proteinuria to normal levels (0.41 ± 0.01 at day 0 versus 0.2 ± 0.02 at day 20; NS; Figure 1C). Nevertheless, although the occurrence of the disease on the kidney graft was clearly curtailed by LF15-0195, this effect was less profound and more transient than that of the native disease. Effect of LF15-0195 Depends on Its Immunosuppressive Activity and not Its Physical Properties. The control isomer (LF15-0296) that has very few immunomodulatory effects (as tested by Fournier Laboratories in various experimental models) had no effect on proteinuria (Figure 1B). That this isomer has the same charges suggests that LF15-0195 did not reduce the proteinuria through an electrostatic effect and also did not influence the ultrafiltration properties of the glomerular barrier. To eliminate further a nonimmune effect of LF15-0195 treatment, we treated proteinuric animals from other models (5/6 nephrectomy and puromycin aminonucleoside) with LF15-0195 or LF15-0296. No improvement of proteinuria was detected in the 5/6 model, and a persistent increase in proteinuria was observed with both drugs (0.55 ± 0.03 versus 0.54 ± 0.08, respectively, at day 0; 0.64 ± 0.07 versus 0.65 ± 0.07 at day 10; 0.67 ± 0.16 versus 0.98 ± 0.27 g/mmol at the end of the treatment). Along the same lines, LF15-0195 had no effect on the heavy peak of proteinuria associated with the puromycin model (acute phase); proteinuria reached a maximum of 6.55 ± 1.50 g/mmol in the LF15-0195–treated group and 6.44 ± 1.00 g/mmol in the control isomer group (day 7; data not shown). No effect of LF15-0195 was observed on the acute or late phases of the puromycin model. Of note, LF15-0195 normalizes proteinuria in Buff/Mna rats with the same range of proteinuria that PAN induces (see Supplemental Figure e). Effect of LF15-0195 on Renal Cell Infiltration and Associated Cytokines. By quantitative morphometric histology, a significant decrease in the quantity of renal monocytes (71%) and T cells (54%) was noted in treated animals (P < 0.05; Figure 3, A and B). The transcript levels of three cytokines (IL-10, IL-13, and TNF-α) that are significantly increased in Buff/Mna kidneys in comparison with healthy rat kidneys (see reference12) were significantly reduced by LF15-0195 treatment for IL-10 and IL-13 (P < 0.05; Figure 3, C and D) but not statistically for TNF-α (Figure 3E). Decrease in renal infiltration of monocytes, T lymphocytes, and associated cytokines upon LF15-0195 treatment. (A and B) Results are expressed as the percentage (means ± SEM) of the surface area occupied by positive cells. Each group consisted of five or six rats. The control groups consisted of age-matched Buff/Mna rats. (A) Monocyte-macrophage (ED1 Ab) populations. (B) T lymphocytes (R7.3 Ab). (C through E) IL-10 (C), IL-13 (D), and TNF-α (E) mRNA expression was analyzed by quantitative RT-PCR in the kidneys of LF15-0195–treated or untreated age-matched Buff/Mna rats. Data are means ± SEM of arbitrary units (AU) relative to HPRT (n = 6). *P < 0.05; **P < 0.01. Action on the NF-κB Pathway. Because LF15-0195 is known to inhibit the NF-κB pathway,15 we investigated its effect on this pathway in the context of Buff/Mna nephropathy. All experiments were performed on isolated glomeruli so as to eliminate any potential activation of NF-κB in tubular cells as a result of proteinuria.16 We analyzed the expression of NF-κB/p65, IκB factor, cPLA2 (whose expression is dependent on NF-κB activation), and the nuclear active form of NF-κB/p65 in glomeruli isolated from untreated and LF15-0195–treated Buff/Mna rats (quantitative reverse transcription–PCR [RT-PCR], Western blot, immunochemistry, TransAM ELISA). We observed no difference in NF-κB activity (data not shown). The basal level of activation of NF-κB in Buff/Mna rats was lower than that in healthy rats. We compared in vivo the effect of LF15-0195 with pyrrolidinedithio-carbamate ammonium [PDTC]; 100 mg/kg per d), an inhibitor of IκB release from the NF-κB complex. We observed no improvement of proteinuria, even though this drug has proved effective in another model of glomerulonephritis17 (Supplemental Figure f). Altogether, these experiments do not indicate a role for the NF-κB pathway in the LF15-0195 effect. Increase of CD4+CD25+ T Cell Frequency. As previously reported,18 LF15-0195 treatment decreased the PBMC count (from 12.5 ± 0.7 × 109 cells/L [n = 20] to 7.7 ± 1.0 × 109 at day 15 and 5.3 ± 0.2 × 109 cells/L at day 30 [n = 10]; fold reductions of 1.6 and 2.3, respectively). Consequently, the T cells count (from 9.1 to 5.3 × 109 at day 15 and 3.7 × 109 at day 30; fold decreases of 1.7 and 2.4, respectively) were also reduced. More interesting, FACS analysis of blood and spleen cells from LF15-0195–treated Buff/Mna rats (n = 5 to 10; Figure 4C) showed a significant increase in the frequency of CD4+CD25+ T cells (P < 0.01) but no change in the frequency of T, B, or NK cells or monocytes (Supplemental Table 1). This effect was constant and reproducible; in all LF15-0195–treated groups, the increase in frequency of peripheral blood CD4+CD25+ T cells (approximately three-fold) was parallel to a decrease in proteinuria below the normal range (approximately 14 d). Significant increase in blood CD4+CD25+ T lymphocytes after LF15-0195 treatment of Buff/Mna rats. (A and B) Representative FACS staining of PBMC of LF15-0195–treated Buff/Mna (A) versus untreated age-matched Buff/Mna rats (B) shows a significant increase in the frequency of CD4+CD25+ T cells (similar dot plots and histograms not shown for splenocytes). (C) Results are expressed as the percentage of CD4+CD25+ T cells in PBMC or splenocytes of untreated or treated Buff/Mna rats at either day 15 or the end (day 30) of the treatment. (A through C) Cells labeled with control isotype antibodies were used as a negative control and are represented in gray on the histogram. (D) Representative histogram of the percentage of FoxP3-positive cells (FoxP3-PE) contained in the CD4+CD25+ T cells as described previously for LF15-0195–treated rats. The dotted line in the histogram represents the percentage of FoxP3+ cells in CD4+CD25+ T cells from untreated rats. *P < 0.05; **P < 0.01. No increase in the frequency of the CD4+CD25+ T cell population was detected in Buff/Mna rats treated with the control isomer LF15-0296 (data not shown). Moreover, the administration of LF15-0195 to healthy rats (Sprague-Dawley) did not trigger a change in the frequency of this population in the periphery (9.6 ± 0.6% in LF15-0195–treated healthy rats and 8.7 ± 0.15% in untreated healthy rats; n = 5; NS). These results were also reported by Cuturi's group in Lew.1W rats19 (unpublished data). In addition, intracellular staining revealed that 65.4 ± 2.4% of spleen CD4+CD25+ T cells and 82.3 ± 4.2% of blood CD4+CD25+ T cells were FoxP3 positive, thereby indicating these cells to be regulatory T cells (Figure 4D). In contrast, CD28, CD45RC, and CD62L markers were unmodified. Finally, we measured the expression of the transcripts of molecules associated and/or involved in the regulation process of regulatory CD4+CD25+ T cells. CD25, glucocorticoid-induced TNF receptor (GITR), cytotoxic T lymphocyte associated protein 4 (CTLA4), indoleamine 2,3 dioxygenase (IDO), and inducible nitric oxide synthase (iNOS) transcripts were significantly increased in the spleen of LF15-0195–treated rats (P < 0.05; Figure 5). No significant increase was observed for FoxP3, whose expression level was low in these samples and therefore probably incorrectly estimated by the Sybr Green technology. Accumulation of transcripts for the regulatory markers CD25, CTLA4, GITR, IDO, and iNOS in LF15-0195–treated in comparison with untreated age-matched spleens. mRNA expression was analyzed by quantitative RT-PCR. Data are means ± SEM of AU relative to HPRT (n = 6). *P < 0.05; **P < 0.01; ***P < 0.001. To demonstrate that the effect of LF15-0195 is mainly due to the induction of regulatory CD4+CD25+ T cells, we performed transfer experiments. The transfer of purified CD4+CD25+ T cells from LF15-0195–treated rats showed a clear but NS trend toward a decrease in proteinuria (0.54 ± 0.03 at day 0 versus 0.31 ± 0.02 g/mmol at day 14; NS; Figure 6B). Interestingly, this was not observed after transfer of the same number of CD4+CD25+ T cells isolated in the same conditions according to the same procedure from untreated Buff/Mna rats (0.54 ± 0.02 at day 0 versus 0.77 ± 0.17 g/mmol at day 14; NS). This finding suggests that the properties of these cells were modified by the LF15-0195 treatment and indicates the acquisition of a specificity for a pathologic element. More important, the proteinuria levels in both groups were statistically different at day 14 (P < 0.01) and day 21 (P = 0.05). Transient regulation of nephropathy after transfer of CD4+CD25+ T cells from Buff/Mna rats in remission into Buff/Mna rats. Purified CD4+CD25+ T cells from LF15-0195–treated Buff/Mna were injected into 4 Gy–irradiated proteinuric Buff/Mna rats (n = 5). The number of injected cells was equivalent in the two groups: 2.57 ± 0.8 × 106 cells in the untreated group and 2.97 ± 0.8 × 106 cells in the LF15-0195 treated group (NS). Data are means ± SEM (scale bar) and are compared with a control group injected with purified cells from untreated rats (n = 5). *P < 0.05, **P < 0.01 between the two experimental groups. The Buff/Mna rat is an original model of spontaneously occurring INS that recurs after kidney transplantation. This model is useful for the testing of novel therapeutics for INS. First, we tested the effect of drugs used by clinicians for INS treatment. Corticosteroids and CsA and their combination had only a moderate effect on proteinuria and did not achieve normalization. Just like the human disease, for which no drugs currently in use can efficiently control the corticoresistant form of INS or its recurrence after transplantation, the Buff/Mna disease is resistant to classical INS treatments. We tested several other immunosuppressive drugs (anti-TCR antibody, mitoxantrone, and anti–TNF-α antibody), but none demonstrated convincing efficacy. Only the anti-TCR antibody (R7.3) significantly but transiently decreased Buff/Mna proteinuria, but normalization was still not reached. Moreover, its use is very limited in time because the induction of immunization precludes us from drawing any firm conclusions concerning either the involvement of T lymphocytes or the efficiency of anti-T therapy for INS. The most promising observation reported here is the demonstration of complete proteinuria remission after treatment with LF15-0195, a derivative of 15-deoxyspergualin. Importantly, this complete remission was associated with a near-complete resolution of ultrastructural glomerular abnormalities, suggesting an impact on podocytes. Because this beneficial effect was not observed in two other models of proteinuria, we can eliminate the possibility of a nonspecific effect on the renal filtration barrier. In addition, the treatment of Buff/Mna rats with a similarly charged isomer of LF15-0195 with very weak immunosuppressive properties had no effect on proteinuria. 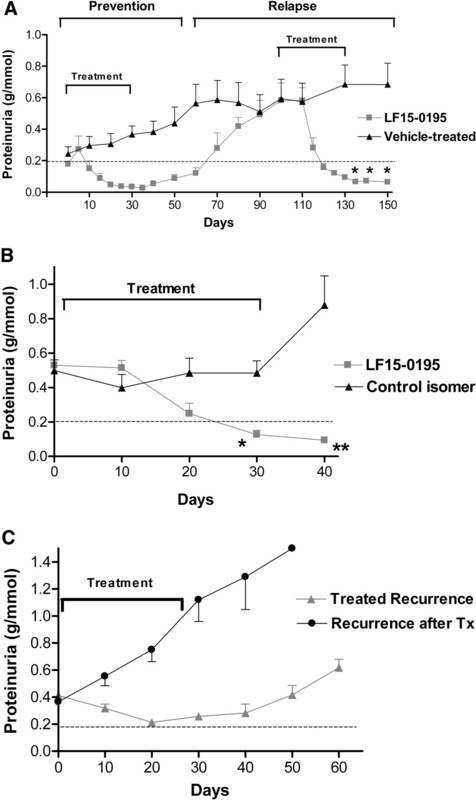 This finding further demonstrated that the effect of LF15-0195 is not due to the restoration of glomerular permeability through an electrostatic effect. Another hypothesis centers on the idea that LF15-0195 decreases graft infiltration, thereby reducing its impact on the organ. In our model, LF15-0195 decreased the quantity of intrarenal monocytes and T lymphocytes (Figure 3, A and B). This finding supports the hypothesis of a pathologic role for these cells in the Buff/Mna disease13 but could be only an indirect effect of treatment. How LF15-0195 modifies kidney infiltration is still unknown, but we hypothesize that regulatory cells play a critical role in this phenomenon. The transfer of LF15-0195–induced CD4+CD25+ T cells to proteinuric recipients led to a decrease in proteinuria that was significantly different from that in controls (CD4+CD25+ T cells from untreated Buff/Mna). This difference suggests that regulatory T cells influence the disease process. LF15-0195 treatment led to a modification in the regulatory properties of CD4+CD25+ T cells, with a more efficient regulatory function and/or a specificity against a pathologic element. This modification explains the inefficiency of natural regulatory T cells. 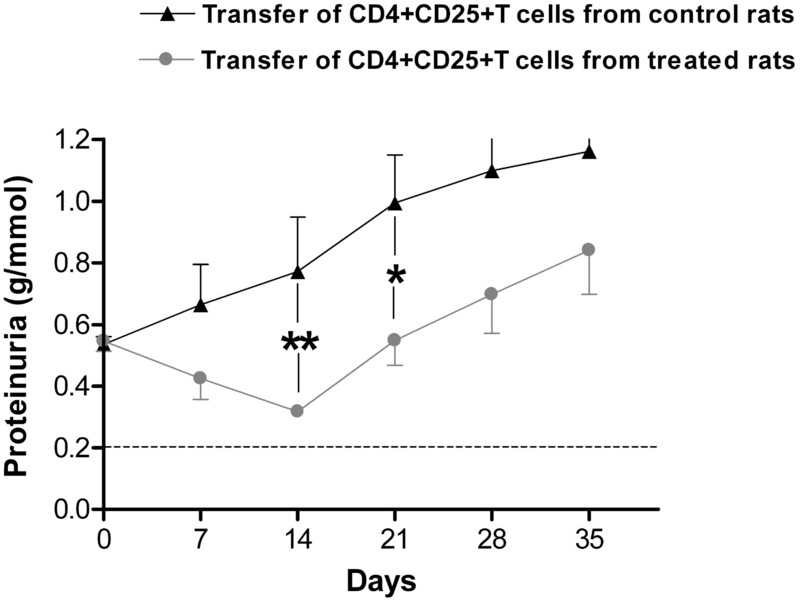 The relatively short therapeutic effect observed after administration of purified CD4+CD25+ T cells may be the result of the short half-life of these cells; previous work showed that these cells rapidly lose their expression of CD25 and regulatory capacities.40 It is also possible that not enough cells were injected to counterbalance the long-term pathologic mechanisms in our model. Further studies focusing on timing, concentration, irradiation dosage, improved purification, or repeated injection of efficient cells could help to improve this effect. Although regulatory T cells indisputably play a role, it is obvious that the drug's effect is exerted through the aforementioned as well as other mechanisms. A recent study showed that the injection of CD34+ stem cells from patients with INS into immunocompromised mice triggered an albuminuria associated with the effacement of podocyte process in these animals.42 We performed the inverse process of transferring cells with the capacity to block and control such pathogenic cells. Both of these studies demonstrated the importance of an appropriate balance of effector and regulatory cells in INS. In summary, we have shown that LF15-0195 has a unique beneficial effect in an experimental model of INS. This drug has the capacity to induce regulatory T cells, which themselves regulate an unknown pathologic mechanism. The idea of using regulatory T cells to treat glomerulonephritis should now be considered,43 especially for the treatment of patients with steroid-resistant nephrotic syndrome or patients with posttransplantation recurring nephrotic syndrome. The Buffalo/Mna rat strain maintained in our laboratory was provided by Dr. Saito (Central Experimental Institute, Nokawa, Kawasaki, Japan). The animal care was in accordance with our institutional guidelines. The rats were placed in metabolic cages for 24 h. We measured the total urinary protein concentration (g/L) by a colorimetric method using a Hitachi autoanalyzer (Boehringer, Reims, France) and urinary creatinine (mmol/L) by the Jaffé method. Proteinuria was expressed according to the formula proteinuria (g/mmol) = urinary proteins (g/L)/urinary creatinine (mmol/L), and it was considered to be abnormal at values >0.2 g/mmol. Six-month-old male proteinuric Buffalo/Mna rats (with a mean proteinuria of 0.5 g/mmol) were allocated into groups of five. The treatments used were methylprednisolone (Solumedrol; Merck, Fontenay-sous-bois, France), CsA (Sandimmun; Novartis), mitoxantrone (Novantrone; Wyeth-Lederlé, Paris, France), PDTC (Sigma-Aldrich, Lyon, France), and LF15-0195 (and its control isomer, the LF15–0296; Fournier, Daix, France). The duration and dosage of each treatment are presented in Table 1. Animals from groups 4 and 5 were killed during the remission period (proteinuria <0.2 g/mmol) for histologic examination. For each treatment, control vehicles (olive oil or NaCl) or isotypic control antibodies were administrated daily to five rats. Only an initial slight and NS decrease in proteinuria was observed in each control group (maximal decrease 14.9%; data not shown). Healthy rat kidneys (LEW.1W) were transplanted into proteinuric Buff/Mna recipients.12 Rats were anesthetized for 90 min by isoflurane/oxygen inhalation. The surgical technique has been described elsewhere.44 The first nephrectomy was performed during the transplantation procedure, and the second occurred 7 d later. The five-sixths nephrectomy was performed by uninephrectomy of the left kidney followed by a ligature of two of the three branches of the renal artery of the right kidney (n = 10). When proteinuria reached roughly 0.5 g/mmol, rats were treated with LF15-0195 or the control isomer LF15-0296. Puromycin aminonucleoside was injected intraperitoneally at a single dose of 100 mg/kg into 10 healthy rats. Proteinuria peaked at approximately 7 d and reached a mean of 6.5 ± 1.2 g/mmol. Treatment with LF15-0195 or the control isomer (n = 5) was given from the day of puromycin injection until day 30. Light microscopic preparation has been described previously.12 Slides were examined by a pathologist in a blinded manner. Lesions were estimated and counted on five fields at a ×100 magnification. For electron microscopic examination, kidney biopsies were fixed in 2.5% glutaraldehyde, postfixed in a mixture of 2% osmium tetroxide in 200 mM cacodylate buffer (pH 7.2), and embedded in Epon 815. Thin sections were stained with lead citrate and uranyl acetate and examined using a Hitachi electron microscope at 2000 KeV. Cells were prepared from 2- to 8-ml blood samples or from an entire spleen. Dilutions and washes were performed in PBS with 0.2% BSA and 0.1% NaN3. After mechanical separation of splenocytes and/or lysis of erythrocytes with hypotonic solution (NH4Cl-KHCO3-Na2EDTA [pH 7.2]), cells were saturated with rat serum, incubated with a saturating concentration of an anti-rat mAb (Ox1+Ox30: anti-CD45; Ox19: anti-CD5; R7.3: anti–TCR-β; Ox8: anti-CD8; Ox35: anti-CD4; Ox33: anti-CD45RA; ED3: anti-macrophagic syaloadhesin; 3.2.3: NKRP-1), stained with FITC-labeled donkey anti-mouse IgG (Jackson Laboratories, Newmarket, Suffolk, UK; Immunotech, Marseille, France), washed, and analyzed. For triple or quadruple staining, cells were simultaneously incubated with a saturating combination of FITC-, PE-, APC-, Alexa 647–, and Alexa 488–labeled or biotinylated mAb (Ox1+Ox30; Ox8; Ox35; Ox 33; Ox22: anti-CD45RC; Ox26: anti-transferrin receptor; Ox 39: anti-CD25; Ox85: anti-CD62L) and then incubated with streptavidin-PE, –PE-Cy7, or –PE-Cy5.5 (Jackson, Immunotech; BD Biosciences, Erembodegem, Belgium; Caltag Laboratories, Invitrogen, Cergy Pontoise, France). For intracellular staining, cells were fixed with paraformaldehyde (4%) and permeabilized by PBS-BSA-NaN3-0.5% Saponin. Antibodies (FoxP3-PE or -APC; eBiosciences, San Diego, CA; Clinisciences, Montrouge, France) were diluted in PBS-BSA-NaN3-0.1% Saponin. Cytofluorometric analysis was performed on a LSR II flow cytometer using FACSDiva Software (BD Biosciences Pharmingen, San Diego, CA). Immunohistology on the kidney slides of untreated and LF15-0195–treated rats was performed as described previously,12 and the cell-infiltrated area was determined by quantitative morphometric analysis.46 Briefly, positively stained cells in each section were counted by morphometric analysis using a point-counting method with a 121-intersection square grid in the eyepiece of the microscope. Results were expressed as the percentage of the area of each renal section occupied by cells of a particular antigenic specificity (±SD). The percentage of area infiltrate was calculated as follows: [(number of positive cells under grid intersections)/(total number of grid intersections = 121)] × 100. The sections were examined at a magnification of ×400. The accuracy of the technique is proportional to the number of points counted; therefore, 15 fields were counted for each labeled section of high density and 40 fields for sections with low density (<10%). We chose a random start point on a border of a section and moved to field in field. Each counted field was adjacent to the previous and next fields.43 Counting was scored in a blinded manner by two observers. Glomeruli were isolated from the superficial renal cortex of rats by sieving.47 Glomerular pellets were lysed (in 2% TritonX-100, 250 mM NaCl, 20 mM Tris, 2 mM EDTA, 2 mM EGTA, 4 mM Na3VO4, 10 mM Na4P2O7, 50 mM NaF, 40 μM leustatin, 0.4 mM PMSF, and 40 μM pepstatin), and their concentrations were measured using the BCA protein assay (Bio-Rad, Hercules, CA). A total of 20 μg of each lysate was used for Western blot experiments according the Bio-Rad instructions (SDS-PAGE 10%; rabbit anti-IκBα or rabbit anti-phosphorylated IκBα [1:1000; Cell Signaling Technology, Danvers, MA] or mouse anti-active NF-KB p65 [10 μg/ml; Chemicon Europe, Hampshire, UK] antibodies; peroxidase-conjugated goat anti-rabbit IgG and donkey anti-mouse IgG [1:1000 and 1:3000, respectively; Jackson ImmunoResearch]). We performed blot quantification using a Kodak Digital Science Image Station 440 CF (Kodak, Paris, France). Buff/Mna rats were irradiated at 4 Gy and received an injection of purified CD4+CD25+ T cells from LF15-0195–treated Buff/Mna rats. Briefly, splenocytes were prepared mechanically by flushing spleens with PBS, mincing them, and filtering the resulting cell suspension. CD4+ T cells were purified by negative selection (staining of the unwanted populations with a cocktail of mouse anti-rat antibodies [Ox42 (anti-CD11b), Ox8, His 24 (anti-CD45R), 3.2.3, and Ox6 (anti-MHC II)]). Unwanted cells were removed with magnetic Dynal beads bound with goat anti-mouse IgG according to the manufacturer's instructions. CD4+ T cells were then labeled with an anti–CD25-FITC (Ox39-FITC) antibody, and CD4+CD25+ T cells were removed by Macs anti-FITC microbeads (Miltenybiotec, Bergisch Gladbach, Germany; positive selection). Cell purity was assessed by FACS and was >85%. The number of injected cells was equivalent in two groups: 2.57 ± 0.8 × 106 cells for the untreated group and 2.97 ± 0.8 × 106 cells for the LF15-0195–treated group (NS). Statistical analysis was performed using GraphPad Prism software (GraphPad, San Diego, CA). We used the Friedman test followed by a Dunn multiple comparison test to compare the proteinuria level before and at various points throughout the treatments. We used the Mann-Whitney test to compare histologic data, cell populations in the FACS analysis (Figure 4), and transcript levels in Figures 3 and 5. This work was supported by the Fondation Progreffe, the Fédération Nationale d’aide aux insuffisants rénaux, and the Agence nationale pour la recherche. We thank Dr. Cristina Cuturi for discussion and advice, Dr. Patrick Dutartre of Fournier Laboratories for supplying LF15-0195 and LF15-0296, and Joanna Ashton-Chess for editing the manuscript.